The Skyline S5 is loaded with features previously reserved for our top of the line machines. 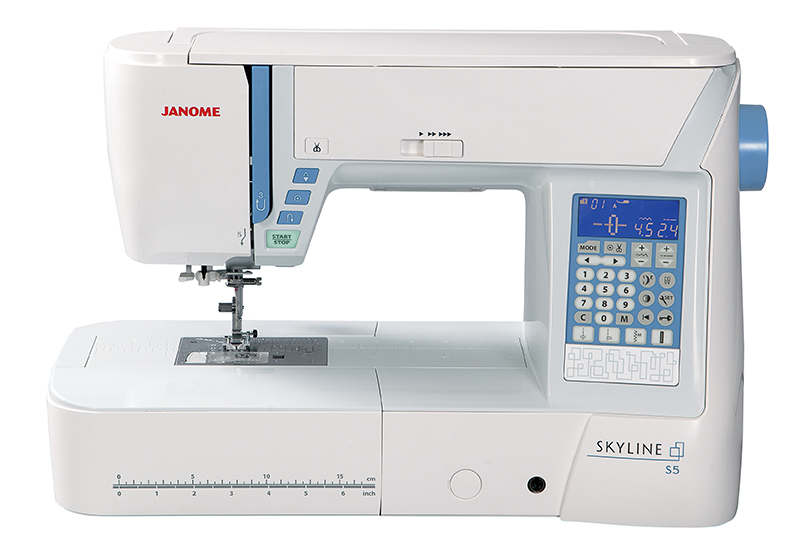 Whether you're sewing, or quilting, the Skyline S5 can help you complete your project with ease. 170 built-in stitches including 10 buttonholes gives you the perfect range of stitches for any task. Special buttonhole settings allow fine adjustments for precise detail. The Skyline S5 offers an unbelievable 91 needle positions. This allows for more detail in decorative stitches, and incredible fine adjustments in all stitch creation. And with 9mm stitch width, this sort of bold detail can be easily appreciated. You can create 9mm wide stitches on your Skyline S5! The extra width makes all of your decorative stitches bolder, brighter, and more distinct. 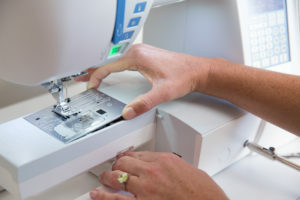 Wider, more distinct stitches allow you to fill more area with stitching, quicker - saving you valuable time while sewing! Ultra-birght LED lights in three locations illuminate the bed of the machine, providing a dazzling work area. Be able to vivdly see your projects and with the extra light, seeing smaller areas is easier. Auto Tension System - When "A" is selected on the tension dial, the machine adjusts the tension based on fabric thickness. Especially useful when switching between fabric layers and types. Allows user to create perfect stitch consistency on a wide range of materials. The user can set his/her own tension traditionally by selecting from the numbers on the tension dial. 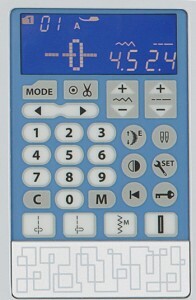 The Backlit Digital LCD Screen shows a range of data for stitches and the feet selection. This very helpful sewing information is displayed in crisp, clear characters with a backlit option to help with visibility. Easy navigation keys are located near the screen and allow the user to easily select a stitch choice and for customization. Using the right tools at the right time is important in sewing. When using lightweight fabrics, or piecing quilts, a straight stitch needle plate makes all the difference. Our One Step™ Plate Converter allows you to easily switch and use the perfect plate for your project. 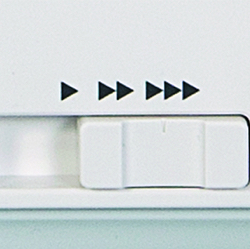 Simply press a button to release one plate to be swapped for another. It only takes seconds, and no screwdriver or external tools are required for the process.To view more information about the One Step™ Plate Converter, click the link below. The ergonomic knee lift is a lever that extends downward from the machine, so that the user can control the presser foot with their knee. This is very helpful when sewing a project that requires you to keep both hands on the fabric at all times. Your hands don't have to move to raise or lower the presser foot! Also, the Ergonomic Knee Lift is useful for quilting and appliqué when fabric needs to be frequently maneuvered. 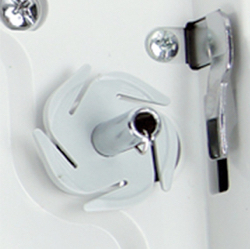 The lift is adjustable so the user can place it in the most comfortable position. The Superior Plus Feed System features a unique 7-piece feed dog system that stays parallel as it moves up and down. This maintains constant contact with the fabric your sewing. This "flat feed" technology provides better control, whether you're sewing forwards, or backwards. 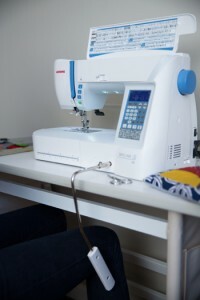 Set the speed for comfortable sewing the speed control slider. This slider allows you to set the top and low end speeds of the machine. Set to slower speeds for intricate work, and high speeds for long straight seams. This is a popular feature amongst beginners. Never sew faster than what you are comfortable with. This minimizes risk of user error and injury. 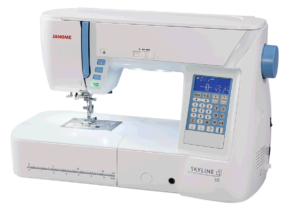 The Skyline S5 features a 1000 stitches per minute max sewing speed and 60 stitches per minute minimum. The specially designed bobbin case and cover means there is no need to pull long threads tails up and through when you thread your machine. 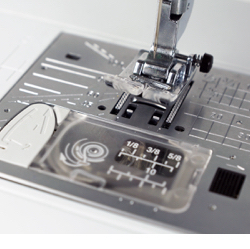 Slip the bobbin thread in the cover plate guide and the built in cutting blades trim the tail to the correct length for a super-clean start to your stitching line. After the initial threading, the auto-thread cutter takes care of trimming and re-setting the tails each time. The new bobbin winder plate has five cutting blades. With faster and smoother winding and easy thread cutting, your bobbin is ready to go!